The scratchings of Tel: Is this 'fame' ? Dead easy isn't it, a quick 'copy & paste' and add it to your website graphic. 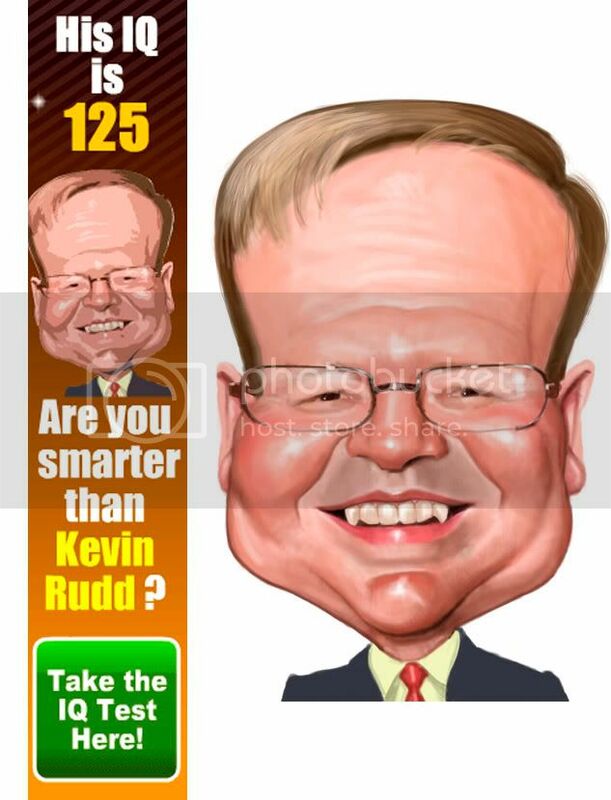 I did this caricature of Kevin Rudd, the Australian Prime Minister, about 12 months ago, I wasn't really happy with it. It isn't on my website just on this blog. Along come a shady mob that hide behind 'www.getyourcrush.com' selling some sort of dubious mobile phone service. There aren't many caricatures of Rudd around, they found mine. This will do to snare a few punters from Australia to do their 'IQ test' . Did they drop me a courteous email 'can we use it' offering some sort of payment. Not on your life - lets just take it. Hello - I do caricatures for a living, you want to use it you ask. I've sent them an email to their 'support' address, the only email I could find, the domain is registered in Canada with no physical real address. I'll see what I can do - I'm not too hopeful. I'd steer clear of the IQ tests if you come across them. Damn Canadians!! Can't trust 'em!!! Seriously...let me know where in Canada Tel. It seems to have disappeared since the email but I have Viscopy who chase up copyright issues looking in to it with their North American compatriots, so hopefully they've seen the naughtiness of their ways. There's probably a cheque in the mail - yeh right !! I know Hanzz - I never liked the big watermarks you put on your caricatures - now know why. There's some sad freeloaders out there ! !